The Carl Martin Crunch Drive is a 9V-battery-powered pedal designed to emulate that "hard to get" crunchy blues tone from a good tube amp. If subtle crunch is your thing, you'll find plenty of cool chord and light solo options here which - regardless of EQ - always sound crisp and lively perfect for jangly chords and light blues soloing. 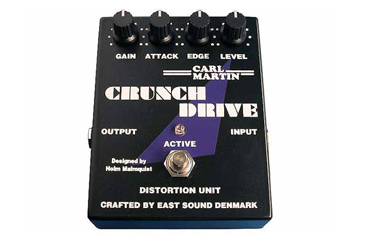 The Carl Martin Crunch Drive is true bypass and features an AC adapter jack.